If you saw my Bosworth jumbles post, you will know I had the pleasure of a very large box of fresh juicy organic citrus delivered to me recently, courtesy of 3p Fruits. 3p Fruits is a Spanish company who grow fruit, nuts and olives on their farm in the Noguera Region and then ship their produce lovingly to our very doors. They grow what we cannot. I’d envisaged a citrus cake of some kind using almonds and honey, so requested these to items as well. But quite what sort of cake it would be, I wasn’t sure until the box arrived. The fragrant pink grapefruit decided me and baking with them was a totally new experience for me. There is nothing quite like freshly ground almonds for baking. They have flavour and texture that I’ve never found in a pre-pack. These Spanish Marcona almonds were not only fresh, but were full flavoured. I was sorely tempted to chomp my way through the lot, before ever they got to the mixing bowl. The honey had a full aromatic flavour which had that unmistakable sun-drenched quality. 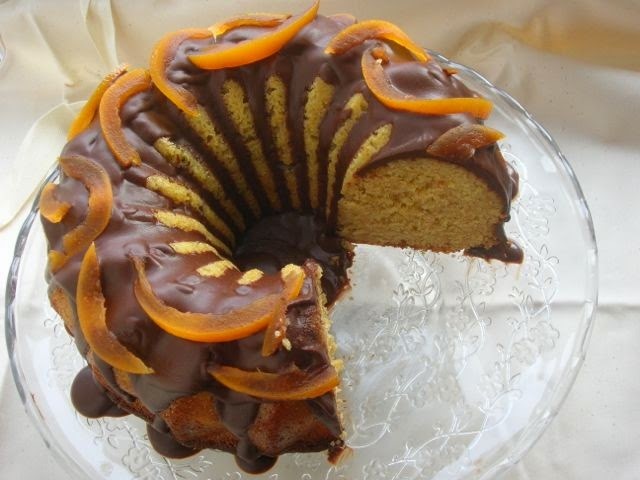 For a really grapefruity cake, I thought I’d use both the zest and juice; I also added some grapefruit syrup to the chocolate topping and decorated it with candied grapefruit. Scroll down to the bottom of the post for the cake recipe. Quarter 2 ruby grapefruits and peel them, trying to keep the skin and pith as intact as possible. Place into a pan of cold water and bring to the boil. Simmer, then drain. Cover with cold water and repeat the process. Repeat 4-6 times depending on how bitter the grapefruit is and how you like it. Drain for a final time and turn out onto a rack to dry for a few minutes. Reserve any grapefruit juice for the cake. Dissolve 100g golden sugar (caster or granulated) in 200ml water over a low heat. Slice the grapefruit peel into thin strips. Place into the sugar water and simmer for 75-90 minutes until the strips have turned translucent. Drain and either spread out on a tray to dry for 24 hours or place in a jar and cover with the syrup. CT reckoned this had the texture of a good Madeira cake and he could smell the grapefruit wafting up immediately. The bitter grapefruit was distinctive and counteracted the sweetness of the cake. It tasted like freshly squeezed grapefruit and had a bracing citrus zing. The freshly ground almonds gave a good flavour and a bit of a nutty crunch. The chocolate glaze was rather powerful, but complemented the cake beneath nicely. It got a big thumbs up from CT and my mother and I was rather partial too. If this cake isn’t for you, head over to Foodies 100, where I have picked ten of the best chocolate recipes I could find this week. With love very much in the air, I am sending this off to JibberJabberUK for Love Cake where the theme this month is For the Love of Cake. I’m also sending this off to Helen at CasaCostello for Bake of the Week. And likewise, this goes to Emily at A Mummy Too for #RecipeoftheWeek. A beautifully textured and delicious bundt cake flavoured with grapefruit and honey and covered in a honeyed grapefruit chocolate glaze. It has a slight crunch from the freshly ground almonds for additional flavour and interest. Cream the butter and sugar until light and fluffy. Grate in the zest from one of the grapefruits and cream some more. Beat in the eggs, one by one, adding a little of the flour if necessary to prevent curdling. Stir in the ground almonds, then sieve in the flour, baking powder and bicarb and stir until just combined. Gently stir in the grapefruit juice. Spoon the batter into an oiled bundt mould and smooth out the top. Bake at 180℃ for about 45 minutes or until the cake is well risen and an inserted skewer comes out clean. Warm 2 tbsp honey with 100ml grapefruit juice in a pan until melted. Pour slowly over the hot cake, allowing it to soak up the juice rather than run off the edges. Allow to cool for 20 minutes, then turn out onto a wire rack to cool completely. Bring 100 ml grapefruit syrup to the boil with 1 tbsp honey and allow to simmer for a couple of minutes. Alternatively, put the 50 ml of water and 50g of sugar in a pan and place on a low heat stirring until the sugar has dissolved. Take off the heat and add the chopped chocolate. Leave the chocolate to melt for a few minutes then stir in the butter until melted and smooth. Leave to cool until thick enough to pour without too much run off. Place the cooled cake onto a serving plate. Slowly pour the chocolate sauce over the top and decorate with the candied grapefruit. The cake can also be made as a tray bake or in a 23cm round cake tin. Many thanks to 3p Fruits for the citrus, honey and almonds. I was not required to write a positive review and as always, all opinions are my own. I’d take a piece of that cake any time. Congrats for the six years! I would love you to have a slice or two of my cake Chris. Thank you. That’s very kind, but I’m sure you could. This cake looks delicious, I will have to give it a try! Congratulations on six years, looks like a lot of hard work! The cake looks scrumptious and I love your bundt form too. Thanks Angie. It’s an amazing mould and transforms pretty much any cake into an absolute delight. Happy blogiversary! It’s fantastic how creative your recipes are – and no loss of enthusiasm for an interesting chocolate recipe after all you have posted! I saw grapefruit in a salad recently and felt it was a challenging flavour but I really like the sound of grapefruit with honey and chocolate! Thanks you Johanna and thank you for reading my posts and for all the comments you’ve given over the years. They are so appreciated. This isn’t a cake for the fainthearted and I doubt children would like it, but everyone here who tried it were enamoured. Congratulations on 6 years of writing about chocolate; it’s amazing that you can always come up with something new. This cake sounds delicious; I’m sure that really good ingredients are vital when using such subtle flavours. Thanks Suelle. The amazing thing is, there is still so much I haven’t done and so much still to try – many of your fabulous bakes for starters. I’m not quite sure I’d call grapefruit a subtle flavour, but it is a very good one. What a wonderful six years you’ve had, too! Congrats! This is a splendid cake to celebrate the occasion! So lush and moist looking! Thank you Susan and thanks very much for all your comments over the years. This is a beautiful looking cake! Love the combinations! Oh sometimes you say the nicest things Dom, thank you :). Not taking a slice warm from the oven is always the hardest part! Happy 6th blog anniversary. The cake looks wonderful and I love the flavour combo. You’ve got the chocolate glaze to drizzle down the cake perfectly! Thanks Katie. I was a little hasty in spooning on the glaze, if I’d left it to set a little longer, I might have ended up with more on the cake and less on the plate. Happy blogversary, and what a glorious cake to celebrate! Here’s to another 6 and 50+ years of blogging! Happy Blogaverary! Six years of awesome chocolate recipe, and here’s to many more! Lovely cake! Oh goodness me!! Another incredible looking cake that makes me drool on the keyboard. How do you make bundt cakes come out looking like that? What is the secret to them not sticking? Thanks Vicki. My secret is a silicone mould, which I spray lightly with oil just to be on the safe side. Happy bloggiversary! The candied grapefruit on this sounds delicious! Thanks Becca. It’s very tasty. I left most of it to dry a little and now have it in the cupboard for ‘mixed peel’. Thanks Jen. You could always make it with oranges instead. Happy Blog Birthday! That cake certainly has an impressive list of ingredients! Wow…. This looks lush! I love the sound of grapefruit cake. I’ve made lots of citrus cakes in the past, but never a grapefruit one! Happy 6th! Six years of compulsory chocolate eating is definitely something to be proud of! Thank you Kate, it was my pleasure. Your posts are always such a treat. Compulsory chocolate eating? Oh dear! Fabulous cake recipe, Happy 6 years of blogging and chocolate eating!Lucky you! Happy blogiversary! A very appropriate date to have started your blogging adventures. This cake looks absoutely amazing. I love the flavour combinations and the bundt cake makes it look so pretty. A very fitting cake to celebrate six years of blogging. I love all the combinations of flavours and textures. Thanks for linking up.